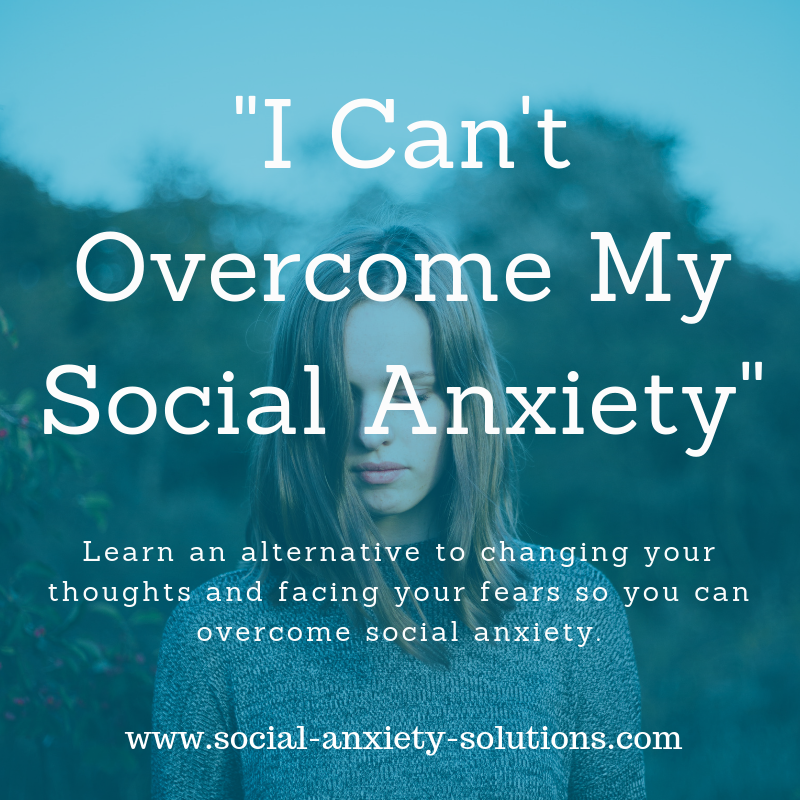 In this post, I’m sharing a quick tip for those of you who feel and believe they cannot overcome social anxiety. Do you want to have your social anxiety sticking around forever? Get on solid ground emotionally with this technique I am offering here. It’s what has worked for me and many others. It might be the right one for you. Keep persisting until you find something that does work and you will overcome your social anxiety for good. Sebastiaan: Hola, this is Sebastiaan from social-anxiety-solutions.com and I’m a former social anxiety disorder suffered. I’m a social confidence coach and I’ve been helping socially anxious clients overcome their social anxiety for the past nine years. And in these videos, I give some tips sometimes long tip, sometimes quick tips. This week I’m going to do a quick tip. So, I’m going to keep this under two minutes. Alright, here we go. So, one thing that my clients sometimes struggle with is the feeling and the belief “I can’t overcome my social anxiety”. Well, why do they have that belief? …you forcefully face your fears, you change your thoughts you’re mindful and still you’re not able to get any results you might face your fears you get some confidence but you can’t keep up with it because you’re not addressing the root cause, the actual emotional problem that is causing the social anxiety in the first place then you might eventually give up. And then you go like “Wow, I just cannot do this. This is too hard, this is too difficult, it’s not working for me. I’m too tough of a case. The one thing that I’ve been promised to work that is the solution doesn’t work for me”. Alright, it doesn’t work for me, I can’t overcome it. Now that can be that can be traumatic enough itself because it’s such a big disappointment and such a damper on your motivation so that can really hit you hard but if that’s you, I just want to talk to you and say “Hey, not all approaches are the same”. There are more ways that lead to Rome as the old saying goes, okay? I have a particular approach and I’m not even saying that that’s the only one. In fact, I know several approaches to get there. There actually are many approaches to get there. So, that’s one thing. The other thing that I want to say is like when you’re taking a cognitive behavioral approach to an emotional problem, you’re going to not get the results that you want, okay? So, social anxiety is more of an emotional problem. You can’t logic yourself out of your social anxiety. If you could you wouldn’t be watching this video, alright? No amount of logic is going to tell your brain. If your brain is perceiving danger and you can tell yourself “Everything’s fine, they’re not assholes, all it doesn’t matter if I get rejected. Oh, embarrassment, I’ll overcome it. I’m actually a good person. I love myself”. All of those things, yeah, you can say them, and it might calm you down a tiny bit if that it might just do the opposite. You can’t logic yourself out of that and I know that you want to change your automatic negative thinking on purpose and repeat them over time to yourself at home and so on and have a very cognitive approach to it but you’re not addressing the emotions that keep you stuck, alright? So, it’s the emotional pull that you can’t overcome with mere logic. And so, it makes a lot of sense that you’re struggling to get over your anxiety completely. And if you look at the statistics for the most well-known approach to deal with social anxiety because it’s not overcome your social anxiety then you’ll see that you’re not alone in not succeeding at this, okay? So, take heart, there are different approaches and if you haven’t succeeded at that, not every approach works for every person. So, simply try something else, keep trying and eventually you’ll find something that actually starts to work for you very, very well. Same thing if you try what I suggest you and it isn’t working. Alright, great try something else. Keep trying until you find something that does work, alright? And like I said there are many ways that lead to Rome. And what I do want to say if you try something give it a committed try. 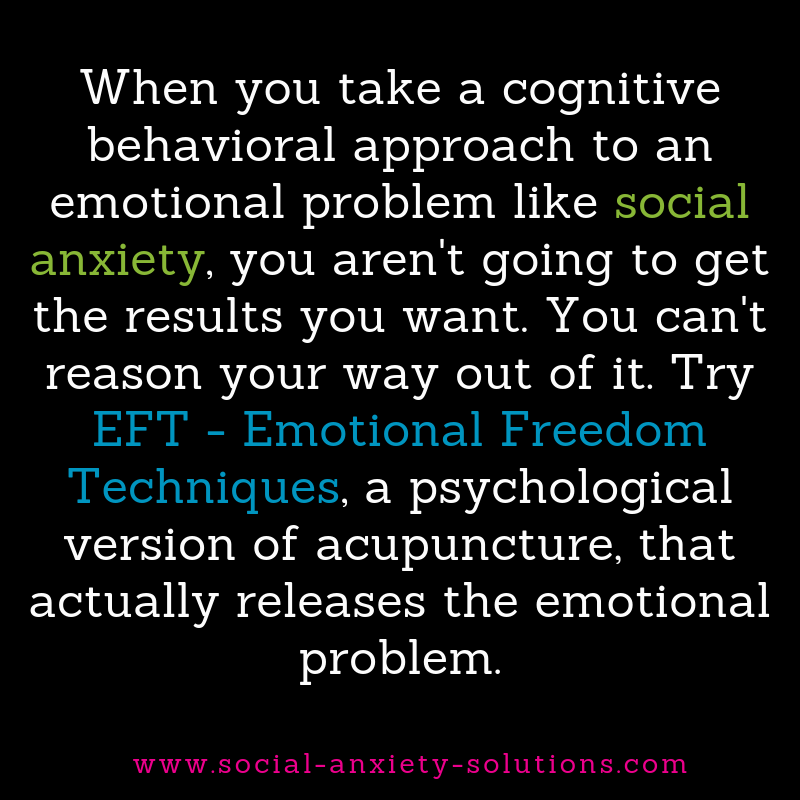 What I promote a lot is tapping EFT – Emotional Freedom Techniques. A psychological version of acupuncture that deals with the emotional problem that you’re dealing with. It’s a technique to rapidly release trapped negative emotions. So, the perception of danger that is there. You’re in a social situation you’re afraid “Oh, no, I’m going to get rejected”. You have a fear response which is emotion that you’re going to get rejected because when you get rejected you feel hurt, you feel pain, you feel embarrassment, you feel shame and that’s emotional. 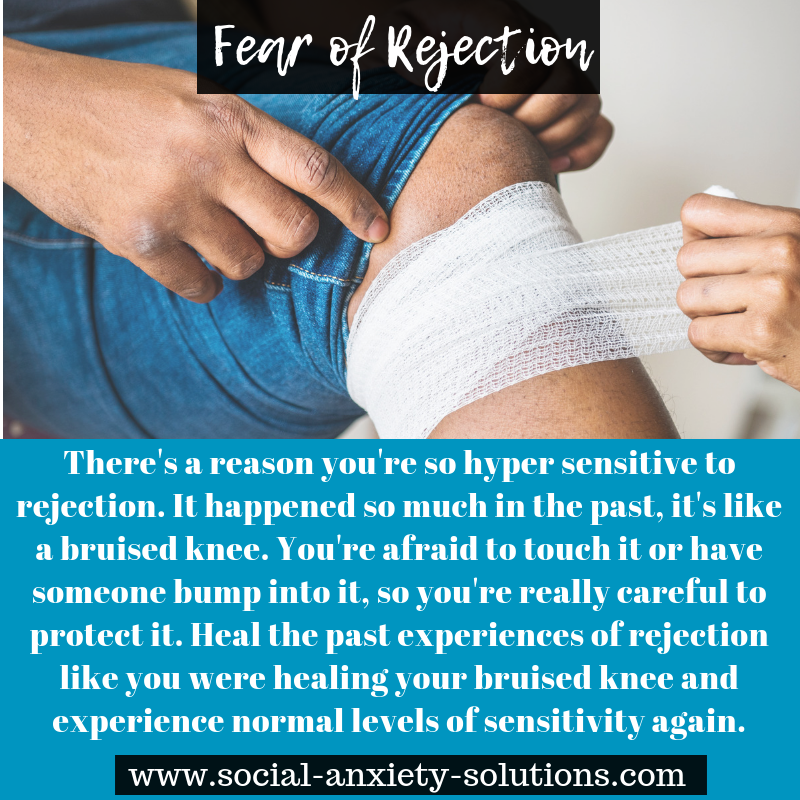 So, you are having a super sensitive reaction to rejection because you’ve been rejected in the past and it was pain and that these painful, emotionally painful experiences are still alive in your brain that haven’t been processed. And so, with tapping you can process these experiences. You can release those emotions so that your hypersensitivity of rejection restores itself and goes back to normal. There’s a reason why you’re so hyper sensitive to rejection. You’ve had it in the past so many times that it’s like you’re having a bruised knee. You’ve fallen onto your knee and it’s still really bruised, and someone can just touch it lightly you go ahh and you’re afraid to walk on it properly because you might bump into something and you’re careful around people because what if they touch your knee you’re going to suffer so badly. Whereas if you heal those past experiences of the rejection you heal your knee then the big bruises on your knee are gone and your knee is restored to its norm level of sensitivity and then someone can tap on your knee and you’re like okay, you want my attention, what’s up? Then it’s not so much of a problem anymore, all right? So, if you decide to do some of this tapping that I recommend that I have a whole bunch of videos on my channel and I offer you a free starter kit on my website where you get ten videos, five of them I teach you how to do it, another five I guide you through some experience of it. So, you feel your emotions actually shifting your body. If you’ve never felt that that’s an amazing experience because you notice like “Wow, I can actually control my emotions with this”. It’s a very empowering thing to experience. You can get that at social-anxiety-solutions.com. Click the link below this video. Anyway, if you try some of this, give it a committed try. Don’t give it a half assed tries like I’ll tap along with one video now I’ll see how that goes. There is so much more to it to overcome your social anxiety then to just tap along with the video. I’m running an online community now. It’s not open for registration but we’re going through this, we’re going through these different modules to overcome our social anxiety and we’re three months in and we’re doing tapping exercises every single day to gradually chip away at this problem of social anxiety and so that you can actually get to a place where you’re free of it where it doesn’t bother you anymore. Alright but because you’ve been dealing with it for a long time it’s going to take some time. It’s going to take some time to unwire to release those traumas to get rid of the repetitive negative experiences from early childhood to deal with the beliefs that caused the perception that you’re in danger. To restore your normal sense of sensitivity when it comes to rejection or embarrassing yourself or being criticized and so on. To get you to a place where you don’t take yourself so seriously anymore because it’s nice to say, “Oh, I don’t take myself so seriously”. But to really emotionally have that. To bring yourself to a place where you’re solid where you’re grounded where you’re at ease, where you’re comfortable with yourself, where you can take a joke and where you freely speak your mind and then you can connect with people. Alright, so, if you’ve been anxious for a long period of time it’s a big problem in your life because it attaches itself to so many different areas. Doesn’t it then make sense that it’s going to take some time to undo that problem to rewire and these automatic programs in your brain, but it can be done and it’s not difficult. It just requires this silly technique done in the right way, aimed at the right targets and a bunch of persistence but you can do it. And what’s the alternative? Sticking with social anxiety for the rest of your life? Is that what you want? So, there’s a lot more to this that I could say in like a quick video, but I just want to point out if you’re going to try something give it a committed go and keep going until you’re free. I started the tapping and it didn’t work for me, but I had seen so many videos of people making transformations, I bought the EFT DVD set. Go and buy that. The original DVD set with Gary Craig. He’s seen working with people with a variety of issues – Public speaking, low self-esteem, fear flying, you name it, war trauma, post-traumatic stress disorder. You would see I saw people make those transformations, so I knew it was for real, so I kept going and eventually ended up working with a practitioner. So, I invested money and then I worked with another practitioner and another practitioner. I started seeing results but just a bit of results. Alright, so, keep going, keep trying. There is something that works for you. Alright, that’s the final message. I said I was going to keep it under two minutes, but I got a bit carried away. Sorry about that. Alright, so, I released these videos every Thursday. You can subscribe here, and I do a podcast as well on which I have interviewed I think over… at least over 50 psychologist, coaches, psychotherapists, PhDs, MDs, doctor, best-selling authors, researchers, whatever. A whole bunch of amazing people for their best social anxiety secrets, solutions, insights, perspectives. When you start listening to that podcast, you’re going to feel a lot more better about your situation because you’ll realize, “Wow, this is not just this dude on YouTube saying that this is the real deal and everything. These are qualified people with accolades and qualifications and all that kind of stuff that are parroting what this guy is saying”. That’s also a reason why I’m interviewing them. It solidifies what I’m trying to convince you off, okay? So, you’re going to feel really inspired listening to those. Alright, so, that’s that. I hope this has been helpful. Every Thursday I release a video like this and I will talk to you soon. Bye for now.